These hamsters are best friends and like to stick together. In playful, simple stories written especially for the K-1 audience, Tip and Tucker will help beginning readers explore new feelings and learn to navigate classroom dynamics and relationships. 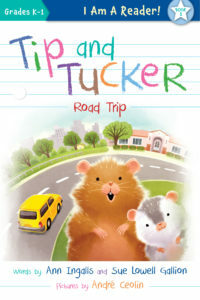 A new Tip and Tucker adventure, Tip and Tucker Hide and Squeak, is coming summer 2019! 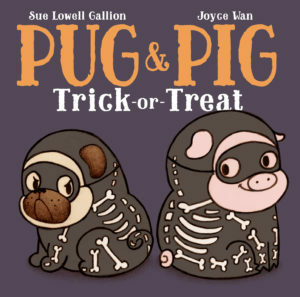 Pug and Pig are back for a heartwarming Halloween adventure in this adorable picture book that’s perfect for pet lovers of all ages. Pug & Pig Trick-or-Treat received starred reviews from both Kirkus and Publishers Weekly! Meet Pug. Pug is one happy pup. He has his own yard, his own bowl, and his own cozy bed. That is, until Pig moves in! 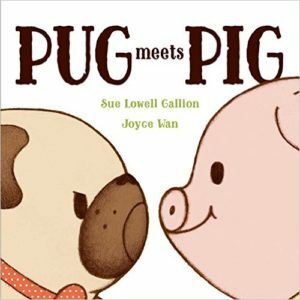 Pug Meets Pig received a starred review from Publishers Weekly and is featured in the Scholastic Book Clubs. If you would like an autographed or personalized copy of any of my books, call Kansas City’s independent bookstore, Rainy Day Books, at 913-384-3126 or go online to Rainy Day Books. Rainy Day Books welcomes special orders and ships books nationwide. Bookplates also available, please use the Contact form on this website to request a bookplate.